How do children see it? 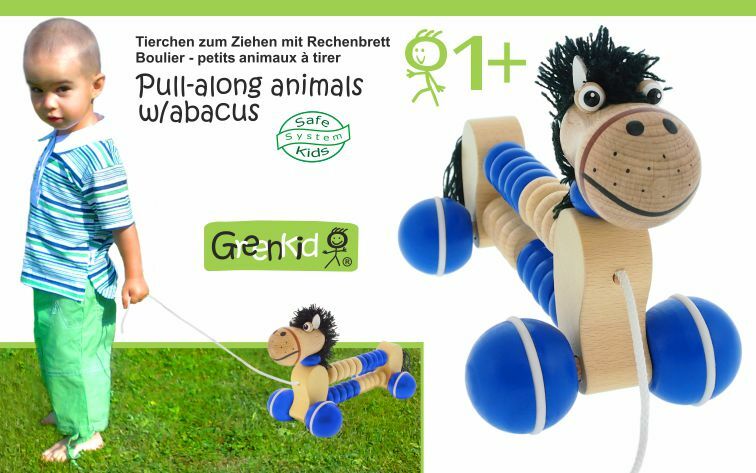 Arched pull-along animals GREENKID are pull-along toys with a pull cord on wheels with a cheerful and witty design and movement. They are safe and hand-painted toys of a high quality. This series of wooden toys offers children their favourite motifs of animals such as a Dachshund dog, cat, dragon and lamb. 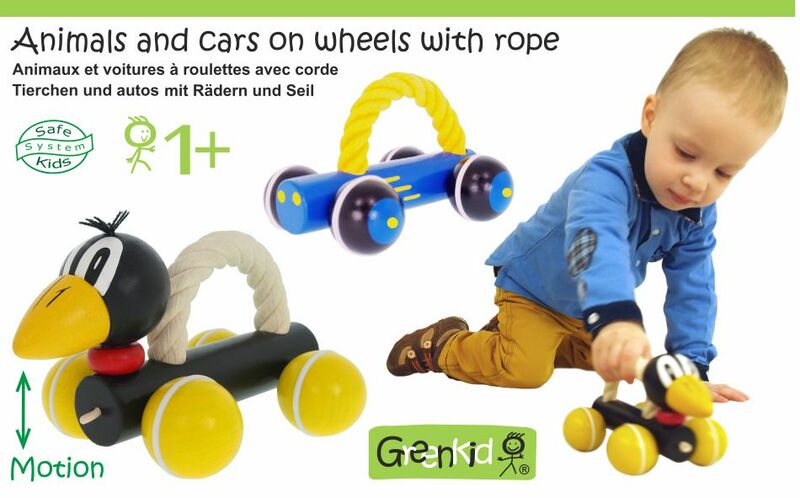 Animals with rope GREENKID are wooden toys on wheels provided with a solid grip rope bent into an arc. These wooden animals are pull-along as well as push-along toys. 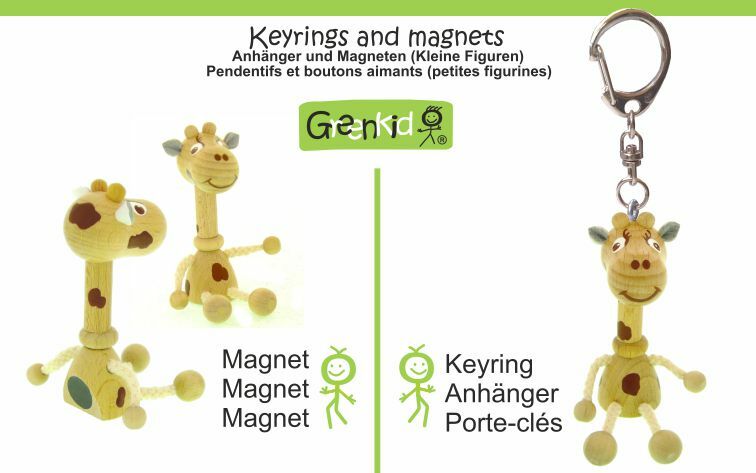 They are very funny and useful toys with cheerful design and funny motion. They are safe hand-painted wooden toys of a high quality. This series of wooden toys offer children's favorite motifs of animals such as a dog, mouse, ladybird or raven. 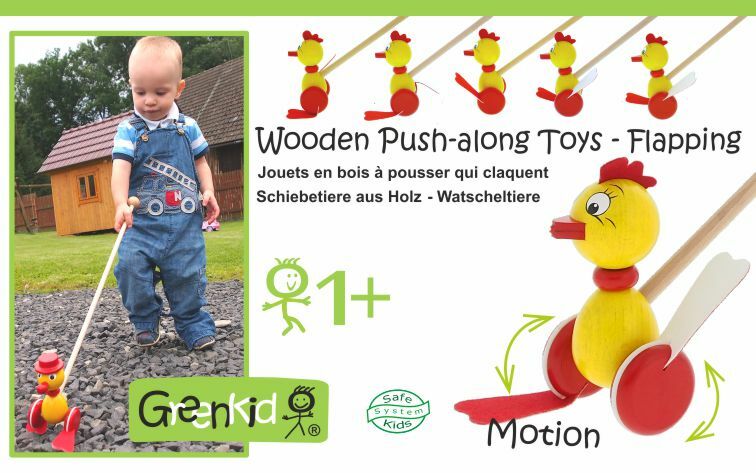 Wooden Push-along flapping toys GREENKID on wheels are very funny as well as useful hand-painted wooden toys with cheerful design and funny motion. They are also very high quality and safe toys. This series of wooden toys introduces children's favorite motifs of animals such as a frog, raven, stork, chicken, duck or ostrich. 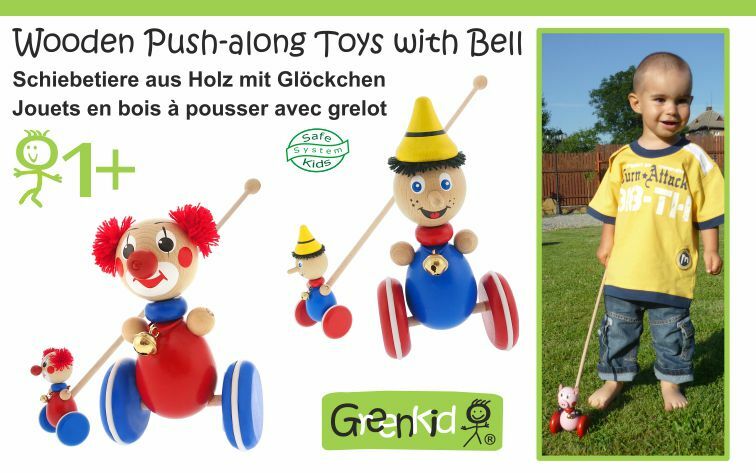 Push-along toys with bell GREENKID are wooden toys on wheels. 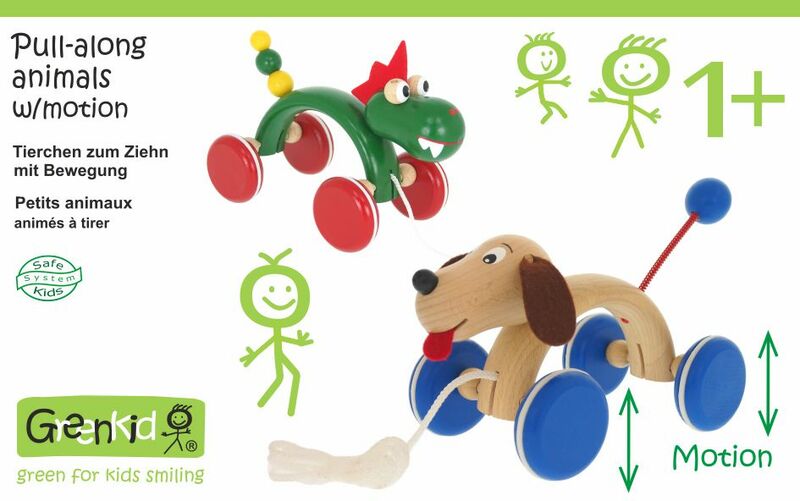 They are very funny as well as useful hand-painted wooden toys with cheerful designs, witty movement and soft sounds. They are also very high quality and safe toys. This series of wooden toys offers children's favorite motifs such as a cow, sailor, clown, dog, dragon, mouse or ladybird and more. Wooden pull-along animals GREENKID are pull-along toys with a pull cord on wheels with a cheerful and witty design and movement. They are safe and hand-painted toys of a high quality. This series of wooden toys offers children their favourite motifs of animals such as a Dachshund dog, Dalmatian dog, dragon, cow, elephant, horse, cat, giraffe, zebra, lion, tiger, rabbit, lamb and a pony. 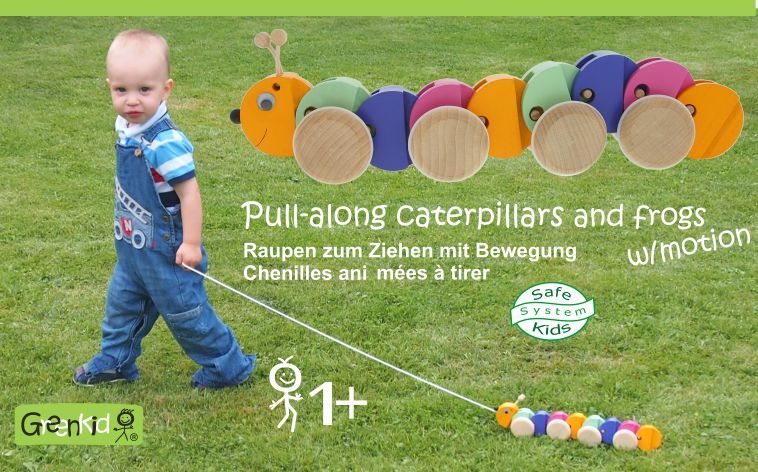 Wooden pull-along caterpillars and frogs GREENKID are toys on wheels with a pull cord with a cheerful and witty design and movement. They are safe and hand-painted toys of an excellent quality. 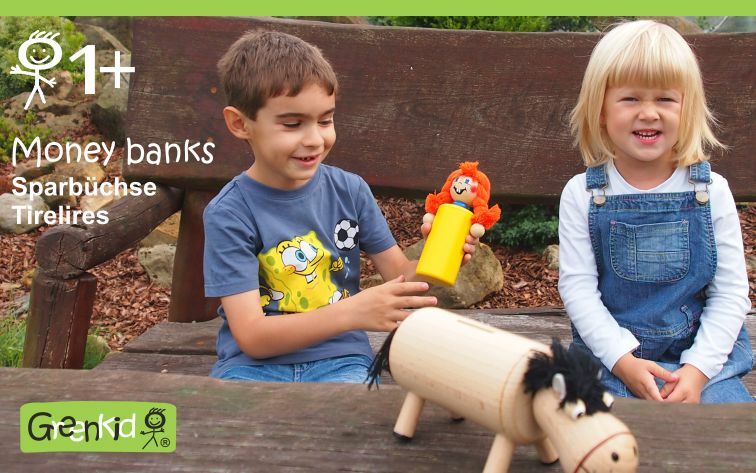 Children's Money Boxes GREENKID are hand-painted, cheerful and practical but they are also very high quality and safe wooden toys. This series of wooden toys introduces children's favorite motifs such as a dog, mouse, raven, ladybird, cow, horse and more. 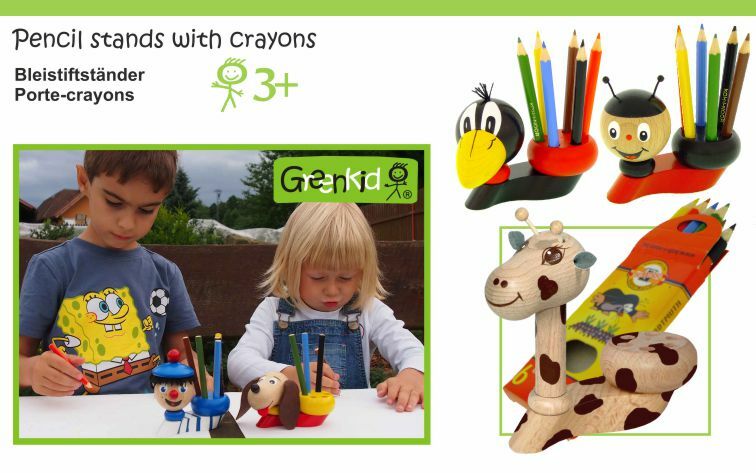 Children's pencil holders GREENKID are hand-painted, high quality and practical wooden toys with a cheerful design. The packaging includes colouring pencils. This range of holders includes a variety of children's favourite motifs such as giraffe, cow, elephant, dog, raven, clown, ladybird, horse, zebra, sailor, Hurvinek, Casper, dragon, honeybee, crocodile, lion and others. Wooden decorations for children GREENKID are hand-painted products of high quality. 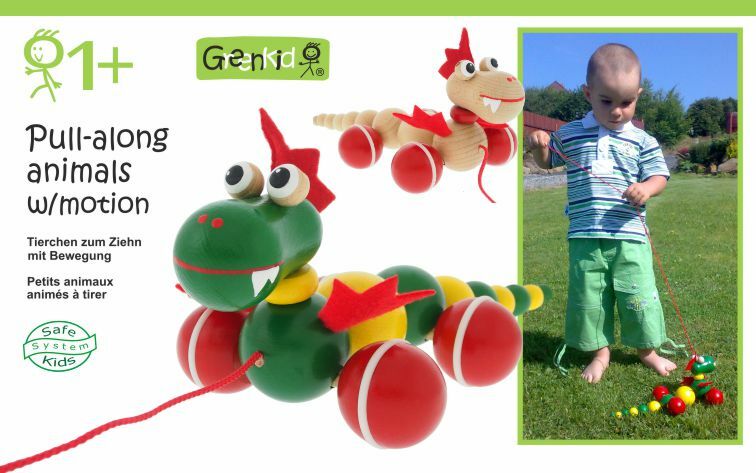 The development and production of all toys and decorations for children GREENKID takes place exclusively in the Czech Republic. Paints and lacquers used for production are of very high quality, harmless to health and certified for the use on toys even for the youngest children. Excellent quality surface and hand-painting is granted on the brand GREENKID together with the use of mainly natural materials. The main material used is beech wood mined exclusively from local forests and in an environmentally friendly way. /////// The ring holders GREENKID are hand-painted wooden figures, which could serve as an original key-ring or a decoration for a rucksack. They are high quality products with a cheerful design and a practical use. This range of products offers a number of children's favourite fairytale motifs, animals, workers etc. Wooden figures GREENKID are hand-painted toys of excellent quality. They are figures with a cheerful design. 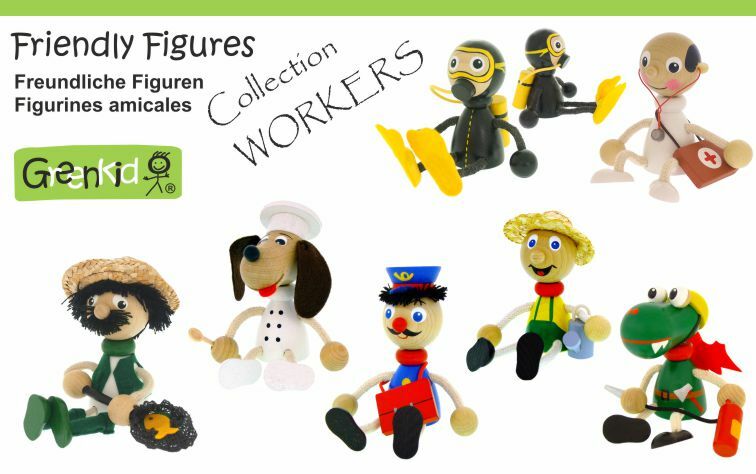 This category includes figures presenting workers in different jobs, which are children's favourites such as fire-fighter, doctor, gardener, chef, diver, fisherman, postman, wood keeper, policeman, sheriff, train conductor, chimney sweep, sailor, astronaut, waitress, soldier, guitar player, saxophone player, drummer, trumpet player, singer, piano player and others. Wooden figures GREENKID are hand-painted toys of excellent quality. They are figures with a cheerful design. This category includes wooden figures presenting a variety of animals, which are children's favourites such as dog, cat, horse, giraffe, cow, raven, stork, mouse, zebra, hippo, rhino, bear, gorilla, cheep, ladybird, bumblebee, frog, elephant, crocodile, lion, monkey, wolf, leopard, tiger, ostrich, fox, skunk, squirrel, duck, chicken, rabbit, beaver, pig, goat, donkey, pony and others. 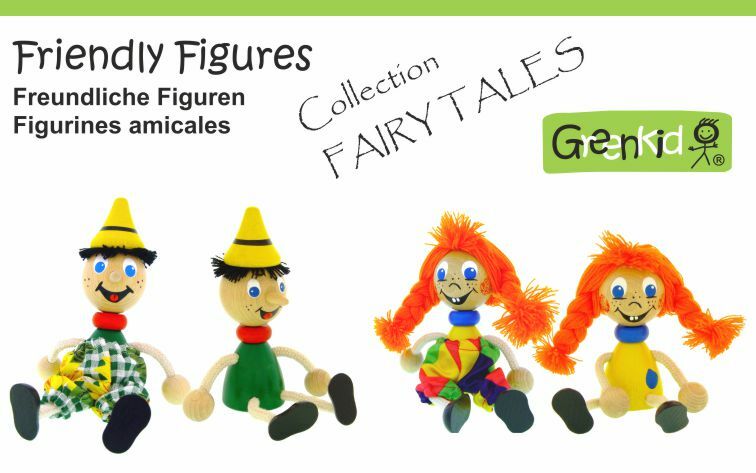 Wooden figures GREENKID are hand-painted wooden toys of excellent quality. They are friendly characters with a cheerful design. This category of children's figures include motifs presenting a variety of favourite fairy-tale characters such as Casper, knight, princess, king, dragon, stupid Jack, witch, wizard, devil, Hurvinek, Manicka, Spejbl, Zeryk, little red riding hood, wolf, pirate, Pinocchio, little dragon, bumblebee, honeybee, beetles, ladybird, dog, chef, Indian, cowboy, clown and others. 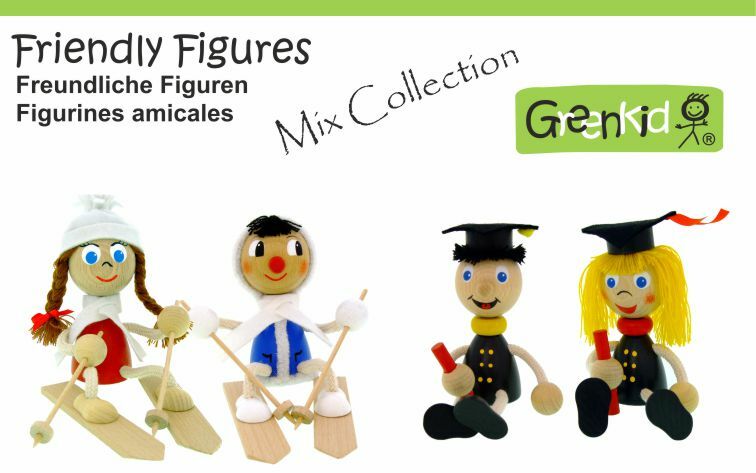 Wooden figures GREENKID are hand-painted wooden toys of excellent quality. They are friendly figures with a cheerful design. This category includes a variety of figures and characters such as groom and bride, male and female students and skiers, hockey player, football player, robot, UFO, girl, boy, snowman, devil, angel, Xmas reindeer and others. Wooden flying figures and four-legged animals on spring GREENKID are equipped by a hanging spring so they draw attention mainly by their movement. They are ideal as cheerful decorations for children's rooms or as entertaining presents for kids or adults. This range of wooden figures offers various motifs such as a flying stork carrying a baby in the beak, raven, witch with a broom stick, honeybee, bumblebee, ladybird with wings, dragon, moving spider or four-legged animals such as elephant, dog, cat etc. 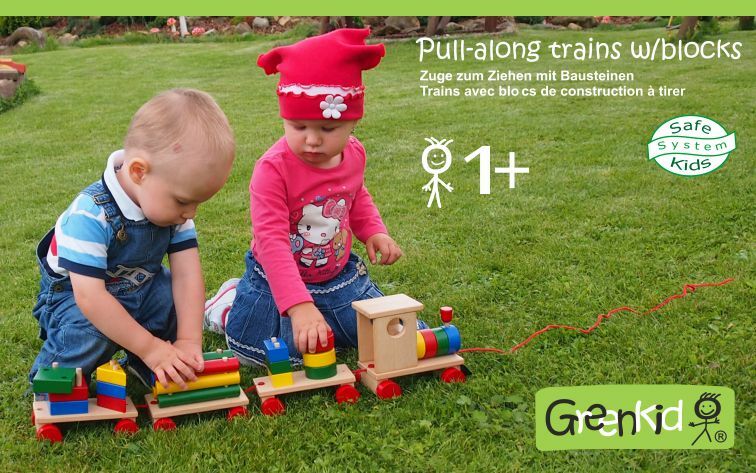 Wooden trains GREENKID are didactic pull-along toys. Folding train consists of a locomotive and three wagons, which carry a cargo of differently-shaped blocks that children can load and unload. If the chimney is removed the locomotive can also be taken apart. When playing with the train children train their motoric skills. Trains are intended for children over one year of age. Small wooden animals GREENKID are wooden pull-along toys on wheels with a cheerful design. Some of them are fitted with a jingle bell, which makes gentle tinkling sound when being pulled. These wooden animals are safe and hand-painted wooden toys of high quality. This series of wooden toys offers children their favourite motifs of animals such as a dog, mouse, cat, ladybird, horse, cow and a frog. 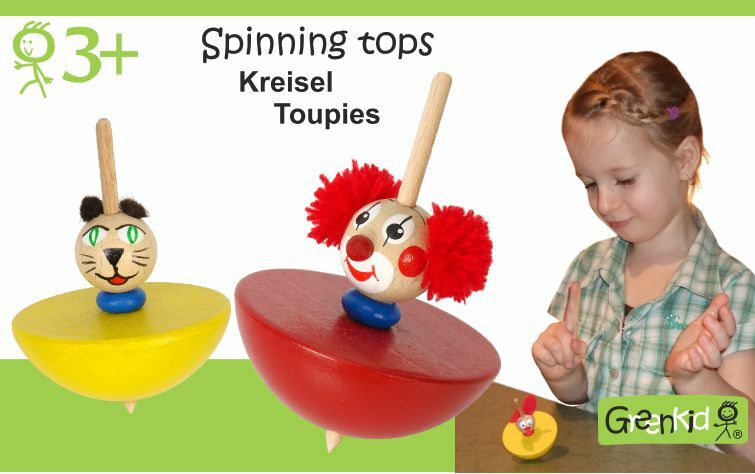 Wooden spinning tops GREENKID are entertaining, hand-painted and very high quality wooden toys with the emphasis on the development of children's motor skills. This range of products includes children's favourite shapes such as a cat, clown, mouse, ladybird, fig or rabbit. Wooden animals with abacus GREENKID are wooden pull-along toys on wheels with a built-in abacus. 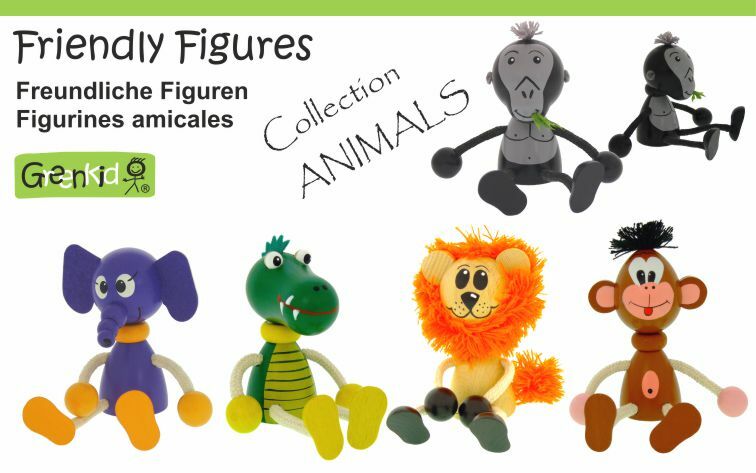 They are cheerful animals with humorous movement, which are safe and hand-painted wooden toys of high quality. 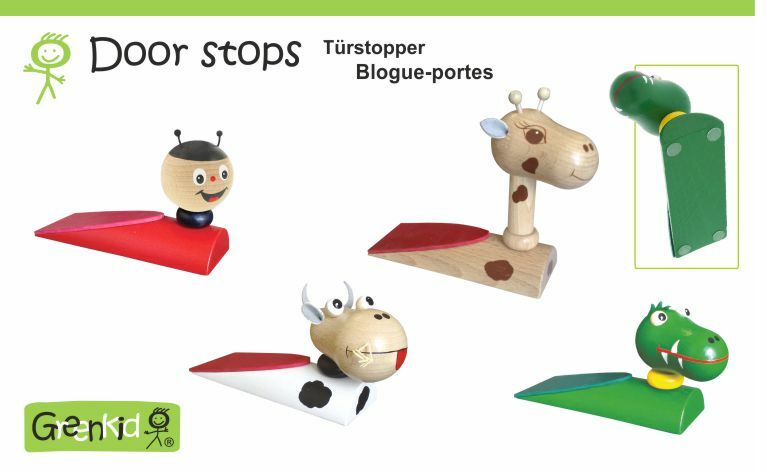 This series of wooden toys offers children their favourite motifs of animals such as a dog, horse, cow, zebra, donkey and a pony or an abacus. Wooden doorstops. High quality and hand-painted functional products by GREENKID. They can serve as functional decorations or practical house accessories. 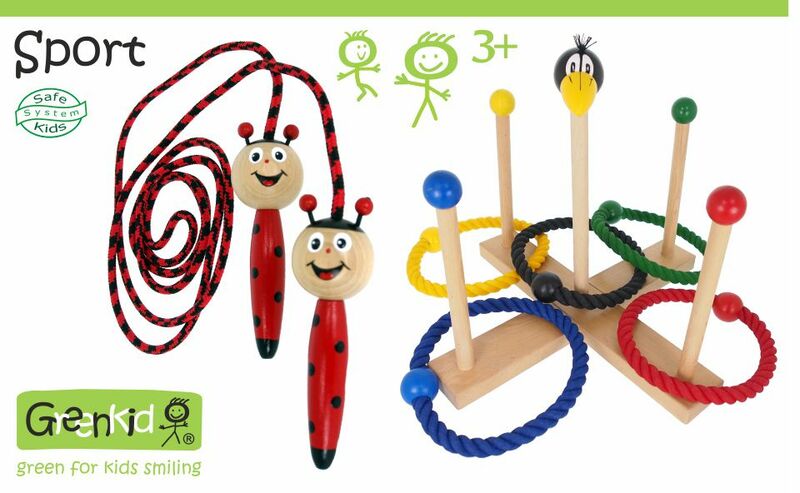 This range of wooden toys includes the following motifs: cow, giraffe, crocodile and ladybird. 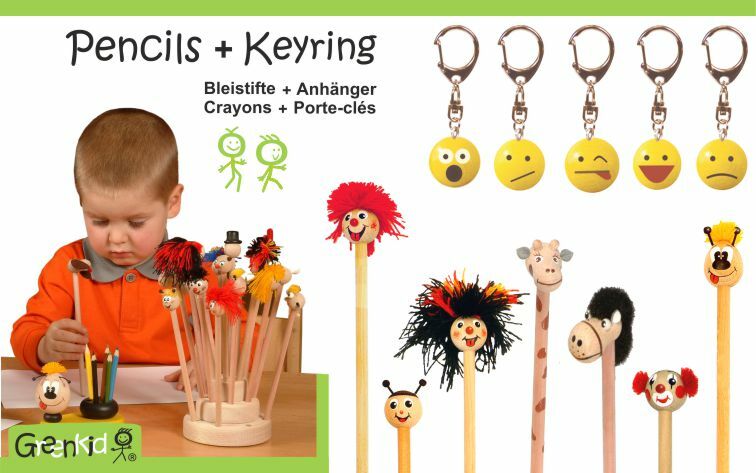 GREENKID ring holders Smiley faces and children's pencils with a head are hand-painted and very high quality wooden products with a funny design and practical. Wooden pencils represent various children's favourite story characters, animals, workers, jobs etc. We are a Czech manufacturer, which specilises in manufacturing of high quality wooden toys and decorations with innovative design. All toys produced comply with the current European standards. We use only materials and paints with safety certificates. Currently we make about 950 kinds of products, but we also continue to develop new products. While developing a new product, we put emphasis on originality, and usefulness for kids. Our manufacture focuses on quality and safety of our products. All our production is located in the Czech Republic.